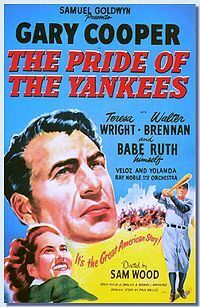 The Pride of the Yankees is a 1942 biographical film directed by Sam Wood about the New York Yankees baseball player, first baseman Lou Gehrig, who had his career cut short at 36 years of age when he was stricken with the fatal disease amyotrophic lateral sclerosis (also known as "Lou Gehrig's Disease"). The movie was released the year after Gehrig's death. It starred Gary Cooper as Lou Gehrig and co-starred Teresa Wright as his wife Eleanor and Walter Brennan as a sportswriter friend. Yankee teammates Babe Ruth, Bob Meusel, Mark Koenig and Bill Dickey played themselves, as did sportscaster Bill Stern. The movie was adapted by Herman J. Mankiewicz, Jo Swerling, and an uncredited Casey Robinson from a story by Paul Gallico. The film includes a re-enactment of Gehrig's farewell speech in Yankee Stadium. The famous line "Today, I consider myself the luckiest man on the face of the earth" was voted #38 in the American Film Institute (AFI) list of the 100 greatest movie quotes of all time.